In May this year the Friends of Turnbull Library reaches a milestone anniversary, celebrating 80 years of supporting and promoting the work of the Alexander Turnbull Library. One of the ways we have begun to mark this special birthday year is by commissioning two writers to produce research essays on the life of our benefactor, Alexander Horsburgh Turnbull. Both Robyn Maree Pickens (of Dunedin) and Redmer Yska (of Wellington) will be writing biographical essays on Alex Turnbull’s life for us, and will be investigating areas such as his alleged homosexuality and drug addiction. In 2010 Cabinet approved a proposal to incorporate Archives New Zealand and the National Library into the Department of Internal Affairs. It was justified on essentially financial grounds. the achievement of cost savings and economies of scale. So, what happened? The financial numbers tell the depressing story. According to Stats New Zealand, average NZ weekly earnings INCREASED 18%. It is clear that lower overheads have not been achieved. Declining expenditure, it can be argued, is evidence of deliberate under-funding, not the achievement of cost efficiencies, or proper support for important legally mandated roles. The Internal Affairs CEO has eight Deputy Secretaries assisting him as part of the Executive Leadership Team, which does not include the National Librarian or Chief Archivist. In 2010 Cabinet approved a proposal to incorporate Archives New Zealand and the National Library (which includes the Turnbull Library) into the Department of Internal Affairs. It was justified on essentially financial grounds. It was claimed that the incorporation would enable the futureproofing of both entities by placing them on a much larger corporate platform, which would lead to lower corporate overheads. More importantly, the Cabinet Paper that advocated the incorporation promised that the statutory functions of both agencies together with appropriate financial safeguards as to their independence would be maintained even while cost savings and economies of scale would be achieved. Amongst those safeguards was the promise, in June 2010, by the Minister responsible for the three agencies, that separate Budget Votes and Ministerial roles would continue. Before the incorporation into Internal Affairs, the National Library’s total Annual Operating Expenditure was $72 million. But by 2018 it had dropped to $62.7 million. Over the period 2013 —2018, it has DECLINED 9.0%, in sharp contrast to the 12.4% INCREASE in Vote Internal Affairs since 2013. Meanwhile, consumer prices — an indication of the underlying cost rises from inflation — ROSE 12.9%. Over the same period, Centrally Managed Costs, which are imposed on the Library by Internal Affairs, and which include property costs, ICT costs, and Corporate Support, INCREASED by 25.7%, with the yearly remuneration of the CEO of Internal Affairs INCREASING by 49%. In contrast, the operating expense of the National Library (i.e the funds under the control of the National Librarian, which do not include Internal Affairs’ centrally imposed costs) amounted to $30.1 million in 2018. Over the period 2013 — 2018 this DECLINED by 24.8%. In 2018, the Capital Charge levied on the National Library, together with Depreciation and the allocation of central costs, accounted for 51.9% of the Library’s total expenditure. The Turnbull’s Annual Operating Expenditure, excluding the allocation of central costs which are borne by the National Library as a whole, amounted to $6.5 million in 2018. Over the period 2013 — 2018 this expenditure has DECLINED by 9.7%. The smaller sum of monies under the direct control of the Turnbull Librarian, have DECLINED by 3.6% over the period 2013 — 2018. In 2013, spending on the Turnbull made up 10.2% of the Government’s Budget Vote for the National Library. But by 2018, the Turnbull’s share of the National Library cake had dropped to 9.8%. Archives New Zealand have also suffered from declining budgets. Between 2013 and 2018, the Operating Expenditure component of the Archives budget DECLINED 18.7%, while the monies under the direct control of the Chief Archivist DECLINED by nearly 30%. Further stress on the Archives budget has come from the INCREASE in Corporate overheads of 279% over the period 2013 — 2019. This article was first published in the Briefing Papers and is reprinted with permission. Dr Donald Gilling has taught at Universities in Australia, England and New Zealand, and for nine years was Professor of Accounting and Finance at the University of Waikato. He holds Fellowships in both Professional Accounting Bodies in Australasia and is the author of over 90 papers in academic and professional journals, covering topics in public finance, accounting and auditing, and the economics of education. He has acted as an expert witness in a number of applications for Judicial Review of the operations and decision making of government and public bodies. He has been a member of the committee of the Friends of the Turnbull Library for nearly 20 years. In mid 2018 the Government called for submissions on the current status and future of “National Archival and Library Institutions” (NALI). The Friends of Turnbull Library immediately submitted that the National Library of New Zealand (along with the Alexander Turnbull Library) needs independence to do its job properly. At present it is under the control of the Department of Internal Affairs (DIA) where it is a subset of Information and Knowledge Services. 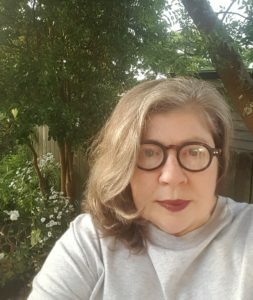 The absence of a clear and specific appropriation for both Archives and Libraries means that there is insufficient transparency as well as a lack of public assurance and safeguards for the financial independence and finances of the National and Turnbull Libraries and for Archives New Zealand. For the full NALI submission see here. Recent further research has been carried out to show the increasingly dismal state of Library finances. See Follow the Money. And see also The Numbers Tell the Story. The Government is planning to make an announcement in the New Year. 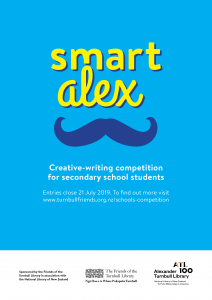 We are delighted to announce all the award-winning entries in this year’s Smart Alex creative writing competition. In the Yr 11-13 category, the winner is: CHARLOTTE BOYLE of Cashmere High School, Christchurch (“Crotchety crochet”); and runner-up is: LIA HORSLEY OF Hastings Girls High School (“Bȃc sī”). Our thanks to all those who entered this year’s inaugural SMART ALEX Competition. Congratulations to all these wonderful achievers, and remember to look out for next year’s competition in 2019. AIM: To create new knowledge about Alexander Turnbull, and to publicise his legacy during the anniversary years 2018-2020. The Friends of the Turnbull Library (FoTL) is now calling for Expressions of Interest in submitting an essay on any aspect of the life and/or collecting role of Alexander Horsburgh Turnbull, who donated his personal collection of about 55,000 books and other items relating to New Zealand and the Pacific Islands to the nation in 1918. This generous bequest became the nucleus of the Alexander Turnbull Library, an internationally renowned research library which opened its doors to the public in 1920. At the discretion of the Friends of Turnbull Library, the expressions of interest will be assessed and entrants will be advised of the terms and conditions. The original concept of an essay competition may be modified to provide research funding to one or more selected entrants. We expect the final essay(s) will achieve a high academic level of accessible scholarship, providing a new perspective on the life and achievements of Alexander Turnbull. Entries may be non-fiction or creative writing. By entering the competition entrants agree to FoTL terms and conditions regarding subsequent publication of your essay and FoTL publicity requirements. The awarding of research funding will be decided by a panel selected by FoTL and the decision of the judges is final. No correspondence will be entered into. Open to anyone (no age limit). Word length: is expected not to exceed 5000 words. Up to $15,000 to be allocated or shared at the complete discretion of the Friends of Turnbull Library. DEADLINES: Expressions of interest (research proposals) must be received by Friday 29 June 2018. Following confirmation of the acceptance of a research proposal, essays must be received by FoTL on or before 1 September 2019. Results announced 15 November 2019. 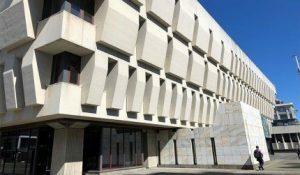 Successful entries may be published in Turnbull Library Record in 2020. E.H. McCormick’s excellent 1974 biography of Alexander Turnbull is meticulously researched and rich with archival detail, but there are various dimensions of this driven and generous man which might produce a fascinating essay. Turnbull’s first racing yacht, the narrow and beautiful gaff rigged cutter Rona, is moored at Chaffers Marina. Turnbull’s history as a sportsman and sailor has been documented by his own account of sailing in Queen Charlotte Sound. What is Turnbull’s history as a sailor? Before he became a dedicated book hound Turnbull was a laddish man about town – what kind of person was he? He came from a close family but his relationship with his sisters, especially the younger one Sissy, seems to have been a bit puritanical – what was he like as a brother and son? Why did Turnbull himself never marry and is the obvious explanation the right one? What was he like as a businessman and how did the business support the ferocious bookbuying? Towards the end of his life Turnbull succumbed to drug addiction, about which McCormick is clear but discreet. What was the incidence of drug use in Wellington at this time and how would Turnbull have acquired his supplies? Who were his close friends? An essay on these, or any other aspects of this remarkable but essentially private man would add to our knowledge and understanding of Turnbull’s life and passions. The Friends of the Turnbull Library is pleased to announce an essay competition with prizes totalling $15,000 to celebrate the anniversaries of the generous bequest of Alexander Horsburgh Turnbull’s library to the nation in 2018, and the subsequent opening of the Alexander Turnbull Library in 2020. We are now inviting expressions of interest in submitting an essay on any aspect of Alexander Turnbull’s life and/or his role as a collector. Essays should be between 3,000–5,000 words in length, and must not have been previously published. We expect they will have a scholarly underpinning and be written in a lively and accessible manner for an informed but not specialist readership. Turnbull’s personal collection, of some 55,000 books and other items relating to New Zealand and the Pacific Islands, formed the basis of the Turnbull Library which has subsequently grown steadily to become the internationally renowned research library it is today, serving all those with interests in the fields of historical, literary, cultural and genealogical studies. The Friends of the Turnbull Library is an incorporated society established in 1939. The essay competition assists our aims to promote public interest in the Alexander Turnbull Library, and to encourage research and use of Library materials to create new knowledge. The deadline for expressions of interest in entering the essay competition is 29 June 2018. Subsequent completed essays must be submitted (by email or by post) by 1 September 2019. The Friends of the Turnbull Library is delighted to announce that two research grants will be awarded in 2018. Wellington historian Dr Vincent O’Malley – whose fine book The Great War for New Zealand: Waikato 1800-2000, was published by Bridget Williams Books in 2016 – receives a research grant to assist him to begin work on a book on the New Zealand Wars aimed at secondary school students as well as a general market. Dr O’Malley says that his project “takes us to the heart of the series of conflicts that profoundly shaped the course and direction of our nation’s history.” The new book will focus on a number of quite lengthy first-hand accounts (manuscripts held in the Alexander Turnbull Library) from Māori and Pākehā who either fought in or witnessed the wars that ravaged New Zealand between 1845 and 1872. From Heni Te Kiri Karamu’s narrative of her remarkable exploits as a wahine toa, through to Gustavus Ferdinand von Tempsky’s colourful account of his time in the Forest Rangers and beyond, these stories will resonate with New Zealanders who are now acknowledging the need to remember, embrace and own our past. Auckland dress historian Angela Lassig receives a research grant towards the publication of an illustrated book on the history of women’s dress in nineteenth century New Zealand. Ms Lassig has drawn almost all her material from the rich and diverse collections of the Turnbull Library. She will be making use of letters and diaries, cartoons and advertisements, sketchbooks and photographs, to create an accessible social history for the study and enjoyment of New Zealand women’s dress and textile heritage. Images will be accompanied by detailed descriptions of the women, their clothing, their social circumstances and additional information such as about the dressmakers and drapery shops that may have been available to women at the time. 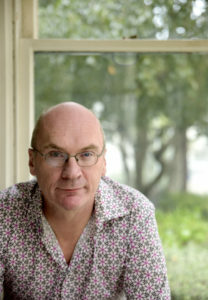 These grants bring the total number of projects assisted by the Friends of the Turnbull Library to fifteen, since the first grant was awarded to Philip Norman in 2004 for his biography of Douglas Lilburn. Six biographies have been awarded research grants and a very diverse range of other projects ranging from a survey of ecclesiastical architecture (2006) to a history of rugby league (2017).